This is not a test, this is your Emergency Broadcast System announcing that USA Network has ordered a second season of The Purge. As detailed by Deadline, the network renewed The Purge television series on Tuesday, November 6, just hours before the James DeMonaco-created horror show aired the final episode of its freshman season. The president of entertainment networks at NBCUniversal Cable Entertainment confirmed the pick-up, releasing a statement accompanying the news. "USA Network is so proud to be the television home for the iconic franchise The Purge," said McCumber. "The partnership and creative trust of Jason Blum and everyone at Blumhouse Television and Universal Pictures ensured The Purge's successful transition from film to TV — and, along with Universal Cable Productions, we look forward to digging even deeper into the mythology in season 2." Jason Blum of Blumhouse Productions, the company behind the Purge film franchise and the television series, had equally wonderful things to say about the show's renewal. "James DeMonaco has done it again — the propulsive and compelling story he crafted for season 1 of The Purge truly resonated with audiences in a significant way," Blum stated. "We are thrilled to embark on season 2, and can't wait to bring more of James' vision to USA and fans of The Purge." Taking into account the harsh critical reviews of the first season of The Purge — which currently sits at a 45 percent approval rating on Rotten Tomatoes and holds a critical consensus that stamps it as "bloated and boring" and proving "that not all stories work better on the small screen" — some might view a season 2 renewal as a shocker. But USA Network hasn't actually made a mistake here and isn't exactly pouring blind faith into a series destined to fail. It's quite the opposite, really. As it turns out, The Purge is the best-performing series on USA Network, sitting in the number one spot with an average 2.3 million total viewers per episode — 1.2 million of which are in the key 18-to-49-years-old demographic. It's evident that ratings mean more than reviews to USA Network, and if people continue to tune into The Purge, the series could stay alive for years to come. Like the four Purge movies (2013's The Purge, 2014's The Purge: Anarchy, 2016's The Purge: Election Year, and 2018's The First Purge), the television series takes place in an alternate United States where all crime is made legal for 12 hours during one night of the year. The show, created by film franchise architect DeMonaco, stars Gabriel Chavarria as Miguel Guerrero, a U.S. Marine who receives a cryptic message from his sister Penelope, played by Jessica Garza, on Purge night. A member of a Purge-worshipping cult, Penelope is prepared to sacrifice herself to prove her faith — but things take a drastic turn when she learns of the true horrors of the Purge and the people who support it. 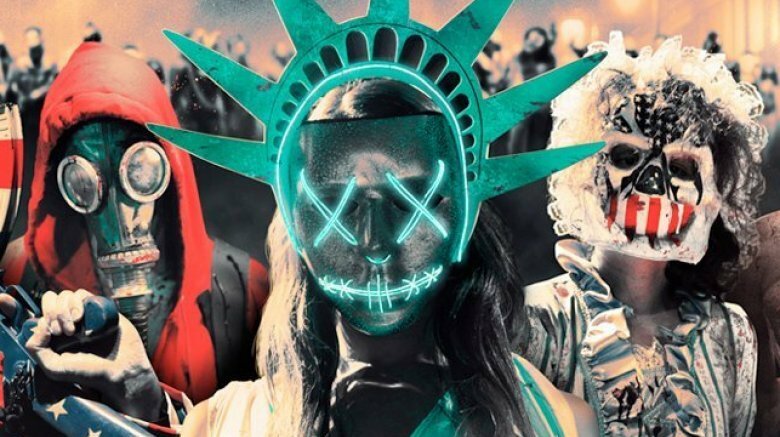 USA Network renewing The Purge for another trip around the small screen comes shortly after DeMonaco revealed that he believes the next entry in the Purge film series could be the last. He shared with Entertainment Weekly, "I think it's a great way to end it all. We want to end it all, I think, in this one, and I'm very excited. When I came up with the idea and pitched it to everybody, they seemed psyched, and I think it will be a really cool ending, how we take this one home." Whether the Purge films will come to a close with the next installment remains a mystery, but if DeMonaco's remarks end up ringing true, perhaps the second season of the series will pick up where the concluding movie leaves off. USA Network hasn't yet announced when The Purge season 2 will premiere.